The Chinese government has tentatively suggested that they would allow a second group of foreign journalists to visit the concentration camps in East Turkistan.This suggested invitation is a positive move on the Chinese part. I would like to extend my gratitude to the world community, especially the western journalists who made this possible by forcing China’s hand. Let it be clear, what we expect is not a theatrical performance or chaperoned tour for the visiting inspectors but an actual facts-finding investigation into the matter at hand. Known to all, Nazi Germany at the time also allowed inspections to German concentration camps, but obscurity, staged tours, and deception by the Nazi government did not help in the prevention of brutal torture or inhumane treatment of the detainees. The tragedy is that 6 million Jewish lives were lost at the hands of Nazi concentration camps and left us an eternally open wound in our hearts. I hope the same tragedy does not happen again in East Turkistan. The Chinese leaders today have the total control over who, when, and where the visitors can go and see; those who were arbitrarily detained, their relatives outside the camps and their neighbors have neither rights nor opportunity to describe the horrors inside the concentration camps, nor can they even mention the existence of such camps. As a leader of Uyghur diaspora and a Uyghur human rights activist, on behalf of all the detainees, I sincerely hope the journalists will be neutral and objective while inspecting the camps. In my opinion, a true journalist will not hesitate to ask the Chinese authorities the questions below during visits; if for some reason they cannot make the necessary inquiries, and simply visit the camps that China wants them to see, listen to rehearsed narratives that China wants them to hear, and then report as is, then the visit will not have served the purpose of independent investigation. It would be looked at as an act of co-defending the Chinese concentration camps instead. For visiting journalists organized and chaperoned by China, I do not know how helpful or effective the questions I have prepared will be, but as a victim and a witness to the ethnic cleansing and crimes against humanity happening today in East Turkistan, I know for certain that I am obligated to relay to journalists that the inquiries below must be passed on to the Chinese government for answers. 1. Is the information regarding locations and number of concentration camps detected by satellite images correct? What kind of facilities are they? How many concentration camps are there and how many people are currently being detained? Why are the numbers kept secret? 2. Why are these “vocational training schools” surrounded by barbed wire and watch towers? Why are the “schools” being watched 24/7 by armed police? 3. What are the health conditions of the detainees, especially the pregnant women, those that are sick and elderly in the past two years? What is the number of the deceased in the concentration camps? How were the bodies of the deceased handled? Were the bodies returned to the families? Can “the burial allowed per local custom for the deceased in the camps” be confirmed? Is it accurate that the deceased were cremated? 4. As reported in the media, one school in Hotan has purchased 1367 handcuffs and electric batons, can the purchase be confirmed? In what manner is the equipment to be used? 5. If the schools are meant for skill learning and/or job training, why are the students not allowed to return home to their families? What harm can their families bring to the “job training”? 6. China claimed that the schools are to cleanse religious radicalism and extremism, can it be confirmed that the lectures are taught by religious scholars and not by the communist party members and/or administrators? Do the teachers possess adequate knowledge in religion? It is reported that GulnarObul, the professor of Kashkar University, was arrested simply because she opinioned “religious extremism cannot be prevented by political indoctrination nor can it be corrected by weapons”, can this be confirmed? 7. Your government stated that the vocational training is provided for those who committed minor crimes for the purpose of maintaining social stability and preventing terrorism. In that case, are the unrests in East Turkistan in recent years the result of a lack of job skills and economic well being for the Uyghur people? 8. It is being reported that RahileDawut (Xinjiang University professor), Irfan Hezim (footballer) , AblajanAwut (singer), ChimengulAwut (poet) and other prominent Uyghurs are being detained, can this be confirmed? What type of job training are these prominent people receiving at the camps? 9. 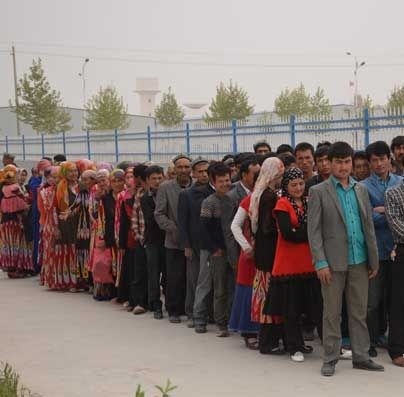 For justification of concentration camps, the Chinese government stated that in the last 24 months, zero unrests occurred in East Turkistan and the “stability was maintained”. The Uyghur leader, RabiyeKadir said “it is true that there was no single revolt or unrest against police in the last 24 months, on the contrary, police brutality against Uyghurs are happening every hour of every day, everywhere; at least one member from each family was taken away black-sacked without any charges by police. There is no single Uyghur family left in East Turkistan that did not experience police brutality either directly or indirectly in the same period.” Is there an answer to counter this? 10. RFA’s Uyghur Language Department was the first news agency that published a majority of the reports about the concentration camps. According to their reports, the detainees are not allowed to talk to one another even after classes; they are escorted by armed police between holding cells and classroomsthey are forced to sing praises to Xi Jinping and the communist party before each meal; however, in the areas we are escorted to visit, we don’t see such a sight, why? Some human right activists say the camps you chaperoned us to see are not the actual concentration camps but are staged locations for performances. Are we allowed to inspect any other concentration camps of our choosing? It is expected that the Chinese government will not and cannot answer these questions, the government may even retaliate against the journalists who dare to ask them. As ambassadors to the truth, justice and freedom, I hope and believe that the journalists will have the courage to ask at least one of the above questions.